Aging memory loss affects us all as we age. But you don't have to take it lying down - you can fight back! This section details the link between aging and memory loss - plus how brain training games, memory improvement techniques, and memory vitamins can help prevent memory loss in seniors. What's The Link Between Aging and Memory Loss? Age-related deterioration in the hippocampus, part of the brain that plays an important role in processing memory. Loss of neurons in the brain, which reduces the activity among neurotransmitters and their receptors leading to memory loss. Decreased blood flow to the brain, which means less oxygen and nutrients reach this complex organ for mental processing. Generally, healthy seniors don't actually suffer memory loss, but more of a slowing down in their ability to absorb new data. So you may find it harder to remember the names of new people you meet, or it can take longer to learn new skills. These are called semantic memories and require conscious effort to learn and store. You may also start to lose episodic memories (such as your 18th birthday) and other events stored in your long term memory. Fortunately, you can slow this process down. Read on for information on brain training, memory techniques, and memory vitamins to limit the changes in the brain and help you retain a healthy memory as you age. Memory loss in seniors can arouse fears of Alzheimer's Disease - but this is very different from typical age related memory loss. Research has found that Alzheimer's often initially presents itself with Mild Cognitive Impairment (MCI) which marks the transition stage between normal aging and dementia. If you fear you may be pre-disposed to Alzheimer's and you want to understand your risk of developing the disease, there is good news. Researchers at Harvard University have discovered that an MRI scan can diagnose Alzheimer's Disease in advance up to a decade before any symptoms begin to show. There are also diagnostic tests that your doctor can perform to help identify neurodegenerative diseases like Alzheimer's and dementia once they have already begun to manifest. If you are concerned about yourself or a loved one please see a doctor. The following are The Big Three when it comes to dealing with age related memory loss. It's important to keep your mind sharp as you age. Studies have found that seniors who do crosswords, puzzles, read, write and play card games delayed the onset of dementia. You only need do this kind of mental exercise twice a day in order to help prevent your mental powers from stagnating. The other good news is, brain training is fun! For memory improvement games, I recommend Lumosity (right). Created by neuroscientstis and game developers, they offer a huge range of simple brain games designed to boost your memory, concentration, flexibility and creativity. By practicing daily, you can track your performance and monitor your level of memory improvement. It's an excellent website for seniors looking to slow the onset of age-related memory loss, as well as students looking to sharpen their skills. 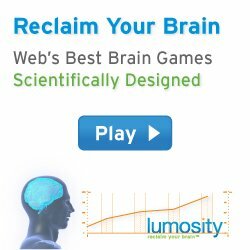 Click here to access free Lumosity brain training games now. To enhance your working memory (and show off to your friends with just how much irrelevant data you can remember!) take a look at Mnemonic Devices. A mnemonic makes it much easier to recall dry data (like new names, phone numbers, shopping lists, and any other facts that have little or no emotional content). The simplest ones are based on rhymes like Every Good Boy Deserves Fudge (a piano reference to remember the Treble Clef notes EGBDF). Meanwhile, more complex mnemonics are based on visualizations to give the boring data some interesting meaning and a richer context. Explore the pages on Mnemonic Devices to memorize lists of unrelated items, remember names of people the first time you meet them and even (if you like) to memorize a deck of cards! These powerful techniques can be applied to everyday life and not only help you recall information much more easily, it is also another great form of brain training. Your brain needs a host of vitamins and nutrients to function properly - and to help fight off age-related deterioration of the brain tissues and neurons. Seniors with memory loss may find it helps to take a memory supplement, in addition to eating a healthy balanced diet. Using the latest memory research, I have compiled a list of the best vitamins for memory loss in seniors. These include vitamins B, C, E and Omega-3 fatty acids. Exercise Your Body - Exercise not only keeps the body fit and strong, but reduces the chances of developing dementia by keeping the heart pumping fresh oxygen to the brain. It also helps regulate blood sugar levels which affect the size of the hippocampus, part of the brain which is critical to memory. Sleep Well - Ever noticed how babies sleep far more than adults? That's because their brains are rapidly developing, allowing their neuronal connections to be remodeled during sleep. So if you are sleep deprived, you are also depriving your brain from essential remodeling work and memory consolidation. Avoid Stress - When you are stressed, the brain releases a chemical called cortisol which adversely affects your memory and other brain functions. So if you are frequently stressed out you will find it tough to recall long term memories - you'll have that feeling that your mind has gone blank - even when the answer should be obvious. Cortisol also diverts glucose in the blood to muscles and away from the brain, so your hippocampus is again deprived of oxygen. Eat Well - Sometimes memory loss can be attributed to a nutritional deficiency in the diet. Experts recommend eating more nutrient-rich foods or specific vitamin supplements to improve memory. This provides the brain with all the nutrients it needs to function properly, including the way it forges and retrieves memories. Concentrate More - It is especially important to combat memory loss in seniors when the warning signs present themselves. Don't allow your brain to rot away by letting new information wash over you, assuming it must be too complicated for you to understand. Regain a positive attitude towards learning, knowing that the more effort you put in, the more reward you will get out. If you know you're suffering from aging memory loss it's essential that you actively engage your brain in challenging mental tasks every single day.